Gunshots were fired near a River North nightclub early Sunday, just days after nearby Sound-Bar was shuttered by the city following a shooting that killed that bar’s doorman and injured its owner on March 8th. Around 2:50 a.m. on Sunday, witnesses leaving a nearby nightclub reported hearing seven to 10 shots fired in the 400 block of North Orleans, police said. Officers later found shell casings in the street on Orleans. 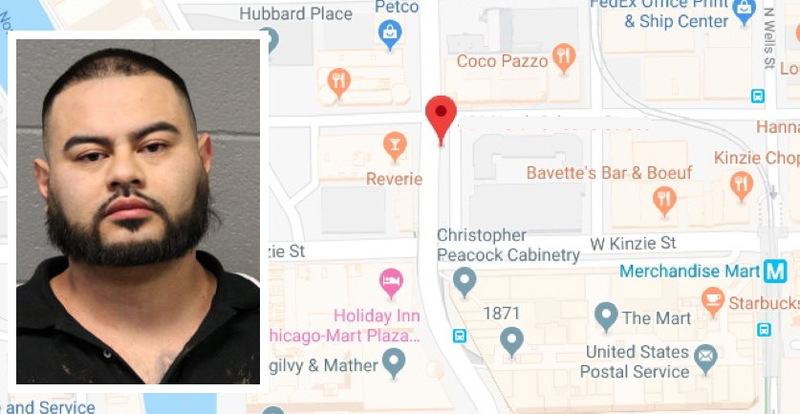 A police spokesperson said witnesses reported seeing 32-year-old Isaiah Ayala of Aurora and another person get into a black Nissan Rogue that sped from the area moments after the shooting. No one specifically said that they saw Ayala firing shots, however, police said. Officers in the Loop located the Nissan Rogue about five minutes after the shooting in the 300 block of West Randolph. Police searched the vehicle, recovered a handgun, and placed Ayala into custody, the spokesperson said. Prosecutors charged Ayala with felony aggravated unlawful use of a weapon. Sunday’s gunfire was reported as River North Alderman Brendan Reilly (42) is renewing his calls for the Chicago Liquor Commission to wield a firmer hand with nightclubs and bars in the area.